Early summer is an “in-between” time in the skies. The realm of the galaxies has moved off to the west, but the summer Milky Way has not yet arrived. This is the best time of year to observe globular clusters and double stars. The centrepiece of the early summer constellations is Boötes, the herdsman, with the bright star Arcturus at his heart. Arcturus is easy to find by following the “arc” of the Big Dipper’s handle away from the ladle: it is the only bright star in this part of the sky. 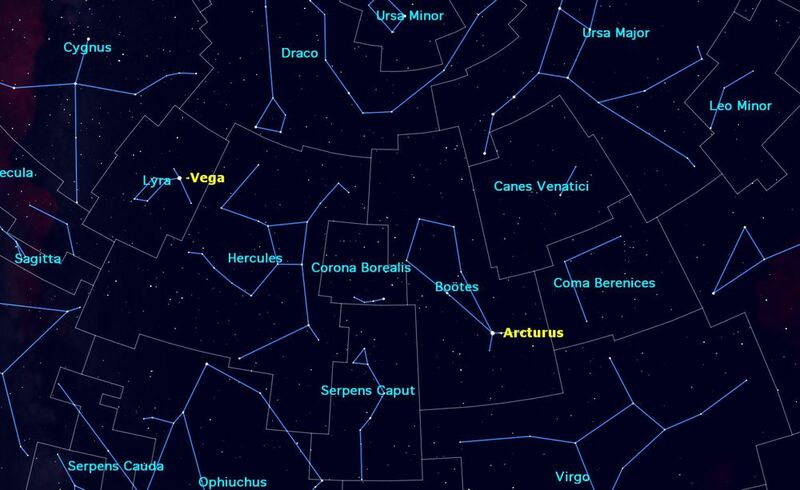 Alternately, if you live in the northern hemisphere, simply look straight overhead around 11 p.m.
Just after dark on a June evening, look overhead to see the constellations of early summer: Boötes, Corona Borealis, and Serpens Caput. Credit: Starry Night software. Although Boötes looks like it might be pronounced like “booties,” the diaeresis (double dot) over the second “o” gives you a clue: the two “o”s are pronounced separately: Boh-OO-tes. Its stars form a distinctive kite shape, complete with tail. Arcturus is the third brightest star in the night sky, after Sirius and Canopus. It is relatively close to us, only 37 light years distant. It is an orange giant star, slightly cooler than the sun, but quite a bit larger in diameter. Boötes contains relatively few deep sky objects, but is rich in double and variable stars. Izar (Epsilon Boötis) is one of the finest double stars in the sky. With a separation of only 2.9 arc seconds, it requires at least 3 inches aperture, steady skies, and high magnification to see its duality; its stars are gold and greenish in colour. Alkalurops (Mu Boötis) is a much wider double at 2 arc minutes separation, but it is a challenge to see that one of its stars is itself a double. Although not within Boötes itself, most amateur astronomers use the stars of Boötes to starhop to the Messier globular cluster Messier 3 in the dim constellation of Canes Venatici. M3 forms an almost perfect equilateral triangle with Arcturus and Rho Boötis. This is one of the finest globular clusters in the sky. Just to the left (east) of Boötes is a small circlet of stars forming Corona Borealis, the northern crown. Look within the circle to see if you can see R Corona Borealis, a very unusual variable star. Some have called this an “inverse nova.” Most of the time it shines steadily with a brightness of about magnitude 7, just below naked eye visibility, but easily seen in binoculars. At long and irregular intervals, instead of brightening like a nova, it dims by about 6 magnitudes. This dimming is caused by occasional expulsion of a dark obscuring cloud of dust. Currently R is entering its dark phase, but keep watching, and it should soon reappear. These three constellations contain many interesting objects to look at with binoculars or a small telescope. Credit: Starry Night software. 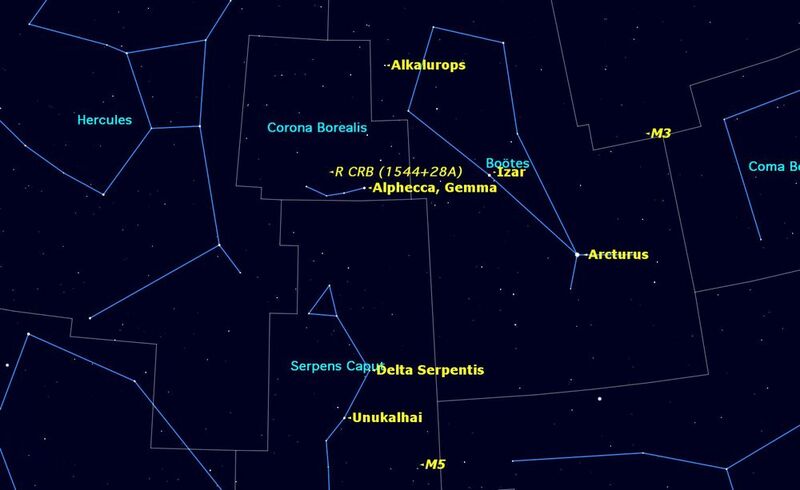 The brightest star in Serpens bears the ugly name Unukalhai, which is Arabic for “the serpent’s neck.” Just above Unukalhai is Delta Serpentis, a fine pair of pale yellow stars in a telescope. But the real prize in Serpens Caput is the globular cluster Messier 5, every bit as fine as Messier 3 to the northwest. Like all globular clusters, M5 responds well to aperture and magnification. Besides resolving the cluster into myriads of tiny stars, a large telescope will reveal chains of stars and clusters within the cluster.